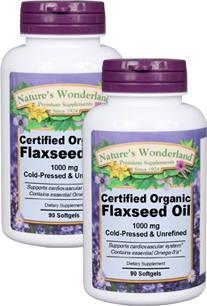 Flax Seed Oil Capsules, Organic - 1000 mg, 90 softgels each (Nature's Wonderland - Penn Herb Co. Ltd.
For those who don't eat fish or who don't wish to take fish oil supplements, Flax Seed oil is a superior alternative. It's been shown to support heart health and to promote the maintenance of healthy skin. Essential fatty acids cannot be manufactured by the body and must therefore be supplied through the diet. Flax Seed Oil is a plant-based source of the essential Omega-3 fatty acid, Alpha-Linolenic Acid (ALA). Cardiovascular support; promotes healthy skin; supports brain & nerve function; joint support; eye health. HINT: Maximize Flax Seed’s heart-healthy benefits with CoQ10, Vitamin E and Hawthorn. As a dietary supplement, take 3 softgels 2 to 3 times daily, preferably with meals.